Science. Why we spill coffee more often than beer. Transporting a round of beers from the bar to your table is an achievable task, but you probably wouldn’t want to carry three cups of coffee without lids. Scientists at Princeton and NYU are explaining why: When it comes to beer, we have the bubbles to thank, the Smithsonianreports. 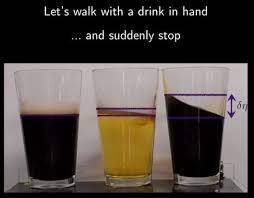 Using high-speed cameras, the researchers recorded motion on the surface of several drinks: coffee, amber beer, and Guinness. Foam reduced sloshing, and the experts say it’s because the foam absorbs the energy of the moving liquid. More foam meant less sloshing. That means that if you’re looking for an easy-to-carry beer, Guinness may be your best bet.